Mary Green celebrates our patchwork landscape of hedged fields. I write this in glorious September weather after a lovely summer for growth and wildlife. Autumn seems strange this year – the leaves are turning early and the fruit is ripe, but the weather thinks it’s still summer. Something we all love about our landscape here is the small fields, bounded by hedges and trees. We take it so much for granted that we see it as a natural part of our surroundings – even the defining element of middle England. People talk about coming in on a plane and feeling at home when they see the “patchwork” of English fields. So it’s always hard to realise that this landscape isn’t natural at all. It wasn’t even the human-defined landscape until around five centuries ago. For most of its life, our landscape hasn’t looked like that. Early agriculture took place on open land, usually cleared from woodland. This may have been owned by someone or held in common, but either way it was usually split up into strips or patches, cultivated and used by individual families. You probably remember “medieval strip farming” from your history lessons. Usually these patches were only lightly defined, certainly not hedged. In many cases the payment made by peasant farmers for their pieces of land was in kind, as a proportion of their crop. They would keep their land rights in the family, but not own the land. There are remnants of old farming patterns, some of which are called “ridge and furrow,” around here. Look out for them in the field on the left as you go up the Birches Bridleway from Withybed to Cooper’s Hill. Or walk up the old “Salt Way” footpath from the little aqueduct under the canal by Scarfield to the top of Grange Lane. The first field here has lots of marks of old cultivation (and a wonderful range of wild flowers). For animals such as sheep, pigs and cattle, again there were not usually enclosed fields. Animals grazed on “the commons”, which might be grassland or might be woodland. A good example of grazed common woodland is Piper’s Hill near Hanbury. The trees were pollarded to keep their new growth out of the reach of cattle. To this day, the wood floor is relatively free of undershrubs or flowers. If you find it odd that animals didn’t just wander off, remember that open grazing still happens in hill and mountain areas. Animals learn to keep to their patch, being “hefted” or trained to do so. If need be, they may belled so people knew where they were, or occasionally tethered. The big change came in the enclosure of land when the wool trade became capitalised. Instead of just rearing animals for local use, sheep were kept as a resource for sale, either as meat or wool or both. Small farmers – peasants – were turned off their holdings and had to become paid labourers as their land was taken over for sheep. For quite a long time there were hedged fields with sheep and also some common lands and strips for crops, but gradually the latter died out. However, remnants of commons still exist throughout England. The coming of the hedges made fields as we now know them. They kept groups of animals separate, and away from arable fields. They also changed the wildlife patterns, often in positive ways. Hawthorn was and remains the most popular hedging tree, though old lines of trees like oak show that woodland remnants were used where possible. The hedges are excellent wildlife corridors, providing flowers for nectar and berries or other fruits for birds. Hedgeside plants like campion and stitchwort, and climbing ones like roses and honeysuckle, contributed to the diversity of flowers. As the hedge developed, birds dropped seeds from other trees too so they became even more diverse. If you see a hedge with mixed native trees (hawthorn, blackthorn, elder, holly, ash, apple, field maple…) it is probably an old one. Much lowland grassland was used both for grazing and hay. It was permanent pasture, and allowed to grow until the grasses and other plants flowered, then cut for hay which was dried and removed. After this the animals fed on the remnants of grass throughout the winter. They left in spring so the grasses and flowers could grow again. Most plants in these meadows are perennials, coming back from the roots as well as seeding. 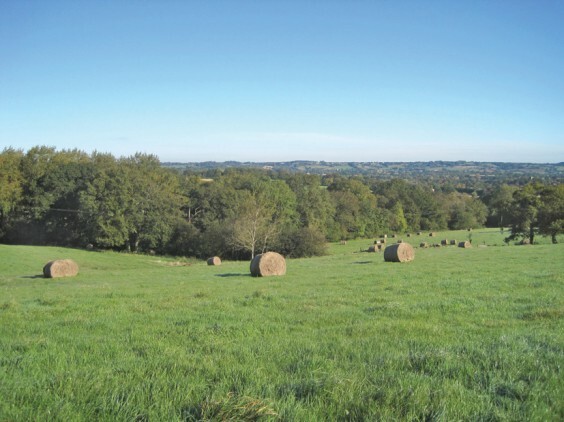 Of course, this depends on some other ground being used as pasture for the cattle and sheep to feed on during spring and summer while the meadows are growing. Where there were still commons this was easier, and it is still practised in areas with hill pasture. Our much loved meadows, like Eades, are this kind of field. Their flowers include orchids (four kinds in Eades), cowslips, moon daisies, knapweed, hayrattle, sorrel, buttercups and many others which we value and often bring into our gardens. They also have dandelions, but they only have one flush in the early spring and then disappear. They tend not to have too much of the “thuggish” plants like brambles and dock – the mowing and grazing regimen helps. Farmland classified as “good” is generally that used for arable crops. Next comes “improved grassland” used for modern cattle rearing and sometimes for silage. This is weedkilled and fertilised and usually has selected varieties of grass and clover. It is not very biodiverse. Then we have “unimproved grassland” which for a long time was seen as less useful or important. This is the kind of field I mentioned by Scarfield Dingle with its rich flowers, insects and birds. Now, it is recognised that “unimproved grassland” is a great wildlife resource and must be allowed to continue. It has some protection now from development. Arable crops were planted in their hedged fields alongside the pastoral fields. They developed their own native flowers: poppy, corncockle, cornflower, corn marigold, camomile, wild radish, heartsease and countless others. These are flowers that love disturbed ground. They are annuals: they seed and reappear the next year after the ground has been turned. Both the perennial meadow flowers and the annual arable flowers need open sunny aspects to grow. If the hedges are tall, there will be other types of plants in the shadier areas – bluebells and cow parsley for example – but mostly in spring. The mixture of arable and pastoral gives the famous patchwork quilt effect. In the mid-20th century farmers began to think that arable fields didn’t need hedges. As farms got bigger and more specialised, arable farms didn’t have animals, so there was no need for hedges. Many were torn out, especially in intensive grain-growing areas like East Anglia. It made tending the crops easier, with big combine harvesters and crop-sprayers not having to move through field boundaries. This coincided with the introduction of weedkillers and insecticides, so the fields became huge monocultures with just grain. Lack of insects didn’t matter because grains don’t need to be pollinated by them. Lack of wild flowers made harvesting easier. Skylarks, lapwings and other birds moved away. Fortunately for wildlife, this didn’t happen in this area with its tradition of mixed farming. And the country as a whole has realised that it was misguided on a larger scale. Grain crops don’t exist in isolation: they affect the balance of the countryside. Much of our loss of bees and birds is now believed to be due to this monoculture. Now there are subsidies to encourage farmers to replant hedges, and leave wild strips along the sides of fields for flowering plants. However, most of the arable plants have become very rare. The corn cockle is an example. It is possibly extinct in the wild in England, though this is still being monitored. It is commonly used in packets of “wildflower seeds”, often imported seeds. Recently it was found on an old industrial site in north-east England, and people were excited that it was still growing in the wild. But no-one is quite sure whether it has been re-introduced from abroad through someone’s garden. To see arable wildflowers properly, you need to visit a reserve. There is a very good one at Blackstone Edge near Bewdley owned by the Worcestershire Wildlife Trust. The corn fields have been re-colonised by poppies and other annual plants. You can still see remnants of them nearer here sometimes around the edges of corn fields where there is poor ground which has been semi-cultivated but not sprayed. They also appear in fields of other crops such as beans, which are sometimes still planted here – I’ve seen them near Cofton. Beans need insect pollination so are less intensively grown and generally have more wild flowers among them. And annual arable plants pop up anywhere that there is disturbed land. The recent patch of poppies by the station works in Alvechurch is a good example. Now I come to how these meadow and cornfield plants may relate to your garden. I’m afraid a lot of people this year bought poppy seeds and tried to grow them in the wrong place. And I have often been asked to identify flowers in people’s “wildflower patches” which they have grown from seed, only to find that they are not native flowers at all. The first thing is to recognise the difference between the perennial meadow flowers and the annual arable ones. Many are marketed just as “wildflowers” or “meadow flowers” without the distinction being clear. The second is to make sure they are English native varieties, and the seeds are English. Next, visit a local meadow or arable field to see what grows around here. Then find a suitable place in full sun, not under trees. If you want a “meadow” patch, it needs to have soil that’s not too fertile. You can start with letting your lawn grow and see what else comes, but it’s a long process. You can strip the grass, and seed with perennial flowers. Or you can do a bit of both – keep the grass and plant plugs and seed of suitable plants, starting with plenty of yellow rattle to control the grass. Add some spring bulbs. Whatever you do, mow it once at the end of the year and take the cuttings off. It will only take a few hundred years to look like Eades! If you plant the right things, you can have flowers through the year. It’s a long term commitment and hard work. For an “arable” patch, you will need to turn the ground and seed it annually, though hopefully much of it will reseed itself. You will get a dramatic and colourful show of flowers in summer. The reseeding is delightfully unpredictable, and a lot of the year you won’t have much there. You may have to remove grasses and other plants you don’t want. I’ve written a lot here about plants in our fields, but a walk through any local fields will also show a variety of insects (including butterflies in summer), birds (including lapwings and skylarks in arable land), large and small mammals (including muntjac, roe and fallow deer, rabbits, hares, badgers and mice). Fields around here range from very biodiverse meadows to monoculture grain fields. A feature of this area is that fields are often not farmed by the person who owns them: many are let or even sub-let, many owned by non-farmers. It means some of them are neither really looked after nor truly unimproved: erratically grazed, fertilised or cut. Fields can, though, be both a valuable resource for farming and therefore food, and a great wildlife habitat. This poem reflects a recent return to the farm where I grew up, staying in the converted cowshed. Is this where we have to live now? Smell of straw and dung, dark. So I was right all the time. Gathering for the autumn like leaves. And the moon rise over the rocks. Owls hooting in the moon filled air.